In Him, you are beautiful, perfect, and everything you will ever need to be. As the holiday season is all around us, and the new year is quickly approaching, I’ve been thinking back over 2016. I don’t know about you, but for me (personally) 2016 was an incredibly difficult year. Over the last 12 months I have laughed and cried, I’ve experienced the joy of new lives and the pain of others as they died, I’ve been blessed by some of the most selfless people I could know and deeply hurt by others I’ve called family. But through it all, the ups and downs, the highs and the lows – one truth has remained the same: all you need is love. Maybe you’ve faced some of these same difficulties this year. Perhaps you are even in the middle of them now. You’re thinking to yourself, how are you going to get through the holidays? How are you going to put a smile on your face when your heart is hurting. Remember, even in the midst of your greatest moments of sorrow, of pain, of hurt, Jesus is with you. His love surrounds you. His peace comforts you. His arms protect you. Thousands of years ago, God’s love for us provided the ultimate answer to every need we would ever have, to every problem we’d ever face. 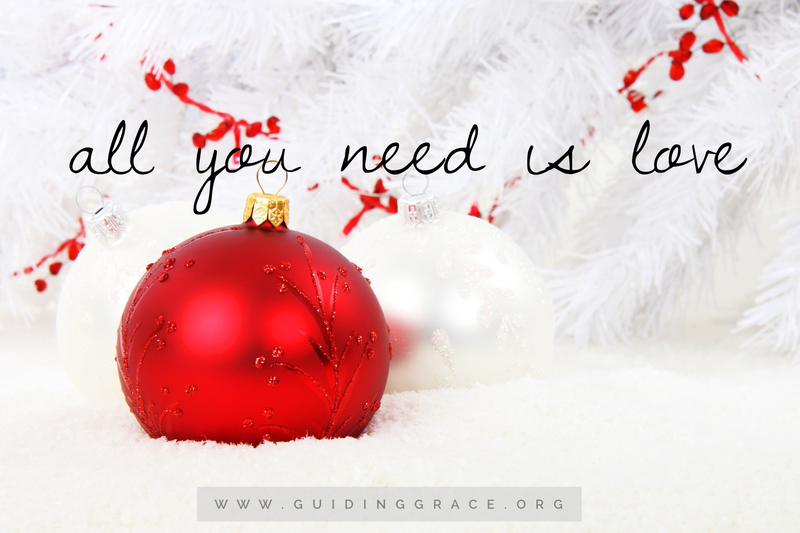 God’s love for us gave us Jesus; God’s own love and grace given to us through flesh and blood. He took on the embodiment of man, was subjected to the ridicule of this world, and suffered our pain and diseases so we could be free – so we could in turn, be living examples of Him, of His love for us. I’ve tried to take this realization, this truth, and see others through His eyes of love this season. And let me be honest with you, it’s one of the hardest things I’ve ever done. I won’t go into details, but know I’ve seen family turn their backs on those closest to them, loved ones die tragically long before they should have, and others have risen up in false accusations. But how do you love someone, as Christ has loved us, when you’ve been rightly wronged? You turn the other cheek and you love them anyway. You do unto others as you would like done to you. You see them through the eyes of Christ, as He sees them. You remember just how much God loves us and challenge yourself to love others even a fraction of that amount. Start walking out each moment as an example of Christ’s love for us. Hold the door open a little longer at the store. Offer to take someone’s cart back for them. Ask the cashier how their day has been. Tell the woman in the dressing room next to you that her dress is beautiful. Make eye contact. Smile a little more. Hum a sweet Christmas carol. Say Merry Christmas to those you pass. I think you’ll find as you begin loving others (even the unlovable) you’ll find your own mood lifted and loving yourself even more. And as a great side effect, you’ll be sharing that love with others and brightening their day too. You never know when your kind word or act of kindness may be the pivotal difference in someone’s dark and desperate life. This holiday season, remember you never know what someone else may have been through that you, and your love, could be the answer to! And if all else fails, just hum the famous little Beatles tune in your head to help you remember, all you need is love. All you need is love. Bum bum bum bum bum. All you need is love. Bum bum bum bum bum bum bum. All you need is love, love. Love is all you need. Enter your email address to follow Guiding GRACE and receive notifications of new posts by email.